“Cute, small and fun...what you need for kids’ parties or family movie nights." This bright and colorful cotton candy machine will look great on display on your counter during parties or any time you’re using it, and it stores easily when you’re done. It’s great for medium-volume use, making a large cotton candy cone in about five minutes – so if you’re making them for a kid’s party, you might want to make them in advance for serving, and make a few during the party so the kids can watch and take turns making a cone — with close supervision, of course. This is a quiet machine since the fan is the only part that makes any noise. It has a clear rim guard so you can see the candy being made, and stable feet so it won’t wander on the counter. It includes 10 candy cones and a sugar scoop. This can use either the special colored and flavored sugar that’s made for cotton candy, or you can use your own hard candies. The machine takes about five minutes to preheat before using, and you shouldn’t leave it running when it’s not in use. This fun cotton candy maker evokes a nostalgic feel, but that beauty isn’t just skin deep — it also works well. It has a clear rim so you can see the candy as its being made and suction cups on the feet so it won’t move, even if it gets bumped. This works with hard candies, so you can make peppermint cotton candy to melt into your hot chocolate, or sour cotton candy to garnish your margarita. It even works with sugar-free hard candies, so everyone can enjoy cotton candy, even if they’re avoiding sugar. Of course you can also buy colored and flavored flossing sugar to make cotton candy that tastes just like the confections you find at a carnival or fair. The machine comes apart easily for cleaning and comes with two reusable cones and a sugar scoop. 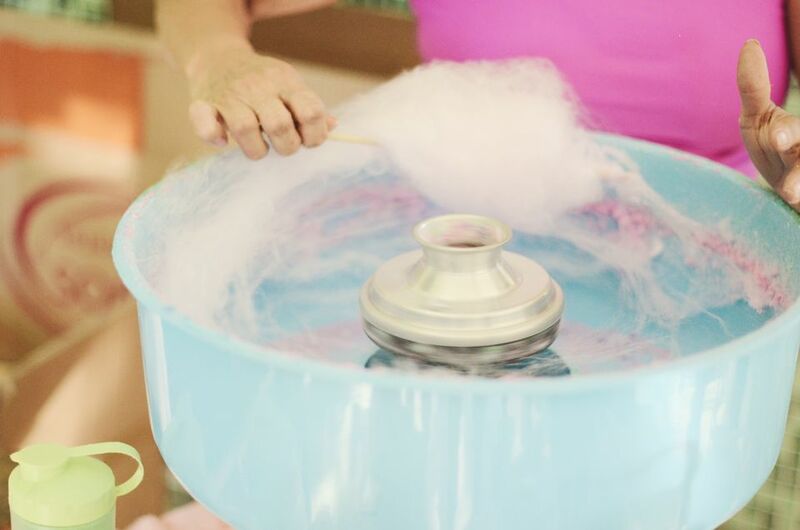 Cute, small and fun — this cotton candy maker is what you need for kids’ parties or family movie nights. It’s built like a mini carnival cart that will fit on your counter or table to make cotton candy from your favorite hard candies or flossing sugar. Even better, you can even use sugar free candies, so everyone can have their favorite, even when they’re avoiding sugar. The clear rim lets you watch the cotton candy form, and it disassembles easily for thorough cleaning. This includes two reusable plastic cones and one sugar scoop. No need to find table space, since this cotton candy maker is a cart that you can roll from room to room or take anywhere there’s an electric outlet to plug it in. This is a commercial quality machine, so it works super-fast, too. It heats up in less than five minutes, then you just pour in the sugar and start twirling cotton candy cones right away. You can make up to two cotton candy cones per minute. The kettle is stainless steel, so it won’t rust, stain, or retain odors, and it’s easy to keep clean since it’s removable. The power switch, heat switch and a volt meter are conveniently located on a front panel, so there’s no need to hunt for the controls. There is a storage drawer with three bins for supplies, so you can tuck away everything you need to make cones for a party. The wheels aren’t just for looks, they’re fully-functional 13" ball-bearing wheels that roll smoothly. This weighs in at 36 pounds, so you know it’s heavy duty, but it’s still easy to move for use and storage. A scoop, manual and spare parts kit are included. This high end machine has the advantages of a commercial quality machine with a 950-watt heating element and a belt-driven motor, but it’s designed to be easy enough for home use. It makes two servings of cotton candy per minute, so you can feed all the kids at a party in no time. This has a three-bin storage drawer and includes a sugar scoop and two extra motor drive belts to keep it running for years. There are separate controls for turning the machine on and for heating. A volt meter on the front of the machine lets you know that it’s operating properly. The stainless steel bowl is removable for easy cleaning, and four clamps hold it in place during operation to keep it steady. This does not have a plastic shield over the bowl. Once you’ve picked out a cotton candy machine, it’s a good idea to get some supplies. Some of the machines include reusable or disposable cones, but you’ll probably need more. And then there’s the sugar. While some machines can use hard candies, if you want classic flavors and the best results (at least until you get the hang of using the machine) you might want to stock up on the sugar that’s designed specifically for cotton candy making. This kit includes 50 disposable paper cones and three different flavors of floss sugar: cherry, blue raspberry and grape. Once you’ve sampled these flavors, there are more kits that include flavors like banana, bubble gum, maple, piña colada and even chocolate. How fun is that?